SR Digi School, Hyderabad has advertised in THE DECCAN CHRONICAL newspaper for recruitment of Pre Primary/Primary/High School Teachers/Non Teaching jobs vacancies. 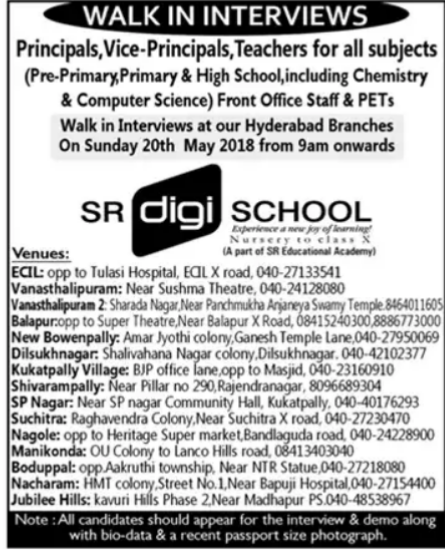 Interested and eligible job aspirants are requested to walk-in sunday 27th May 2018.Check out further more details below. 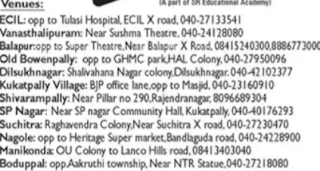 Name of the School: SR Digi School, Hyderabad. About School: Heralding a unique revolution in New Age Technology, SR has now transformed the very basis of how education is imparted in a class. Carrying forward its belief that everyone has a right to affordable quality education, the SR Group now opens up a new dimension in learning with Digital Classrooms that change the way teachers teach and students learn.The platform of Multimedia now adds life and a brand new meaning to the way a lesson is taught and understood. The visual impact not only aids perception and better memory retention, it also gains the complete attention of every single student in class. This concept is poised to inspire and make education an unforgettable journey. Attractive salary for deserving candidates. How to Apply: Walk-in Interviews at our Hyderabad Branches on Sunday 27th May 2018 from 9a.m onwards. Note: All candidates should appear for the interview & demo along with Bio-Data & Recent passport size photograph. 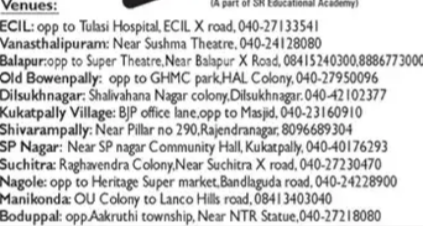 Reference: Advertisement on THE DECCAN CHRONICAL newspaper Dated 24th May 2018.